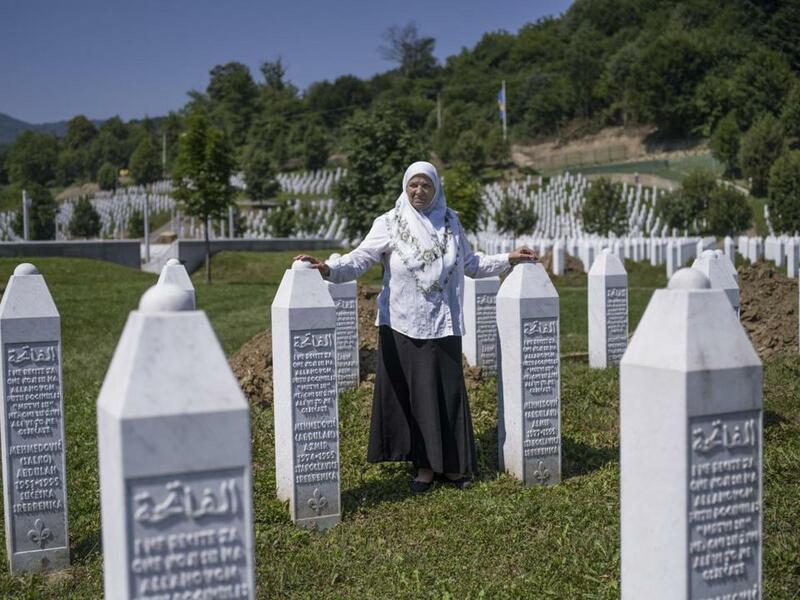 Mrs. Mehmedovic, next to the gravestones of her two sons at a cemetery for victims of the massacre at Srebrenica. NEW YORK — Hatidza Mehmedovic, a fearless campaigner for justice for the more than 8,000 Muslim men and boys who were killed by Serb forces in Bosnia in 1995, Europe’s worst massacre since World War II, died July 22 in a Sarajevo hospital. She was 65 and had lost her own sons and husband in the bloodshed. Camil Durakovic, a friend and former mayor of Srebrenica, the site of the massacre in eastern Bosnia, said she died of complications of breast cancer. Mrs. Mehmedovic was president of the Mothers of Srebrenica. In recent years she spoke out against growing nationalism in Bosnia and called to account politicians who stoked ethnic hatred or denied that genocide had taken place in Srebrenica, as the International Criminal Tribunal for the former Yugoslavia had determined during war crimes trials for Balkan wars of the 1990s. Mrs. Mehmedovic’s husband, Abdullah, their sons, Azmir, 21, and Almir, 18, and two brothers, Edhem and Hamed, died in the massacre, and she told her story of loss to journalists, prosecutors, academics, researchers, school children, and neighbors. The war in Bosnia-Herzegovina erupted in early 1992 after Serbs living there refused to back independence from Yugoslavia following the secession of neighboring Croatia and Slovenia. Serbs in Bosnia took up arms to expel non-Serbs with the aim of annexing conquered territory to Serbia. At the time, Mrs. Mehmedovic, a homemaker, was living with her husband, a security guard at a mine, and their two sons just outside Srebrenica. Bosnian Serbs laid siege to Bosnia’s capital, Sarajevo, and went on a deadly rampage across eastern Bosnia, seeking to drive Croats and Muslims out of their homes in a case of ethnic cleansing. By the summer of 1995, Srebrenica and its surrounding area had swelled to 40,000 people, many seeking shelter after the United Nations declared the area a safe haven. But Serb forces overran the enclave and ordered men and boys to walk across forested hills, pursuing, ambushing, and systematically killing most of them. Mehmedovic parted ways with her sons and her husband in the woods near the town. International investigators found the remains of her husband and sons scattered among the nearly 100 mass graves discovered in the Srebrenica area. They were exhumed and identified before she buried them in 2010 in the memorial cemetery in Potocari, not far from the spot in the woods where she had last seen them. In November, Mladic was convicted of genocide, crimes against humanity, and war crimes by the tribunal in The Hague, Netherlands. He was sentenced to life in prison. Radovan Karadzic, the former Bosnian Serb leader, was convicted of the same charges in 2016 and sentenced to 40 years in prison. He said, “She carried her sorrow and the grief of other women with such dignity,” and described how Mrs. Mehmedovic had told her story repeatedly, tearfully and in great detail. Mrs. Mehmedovic leaves two older sisters. She moved back to Srebrenica, where few Muslims dared to live, in 2003. There she faced harassment by the police and resentment by her Serb neighbors for her denunciation of people living in their midst who were accused of war crimes.